The most recent bout of sea star wasting syndrome has been with us on the west coast for a couple of years. 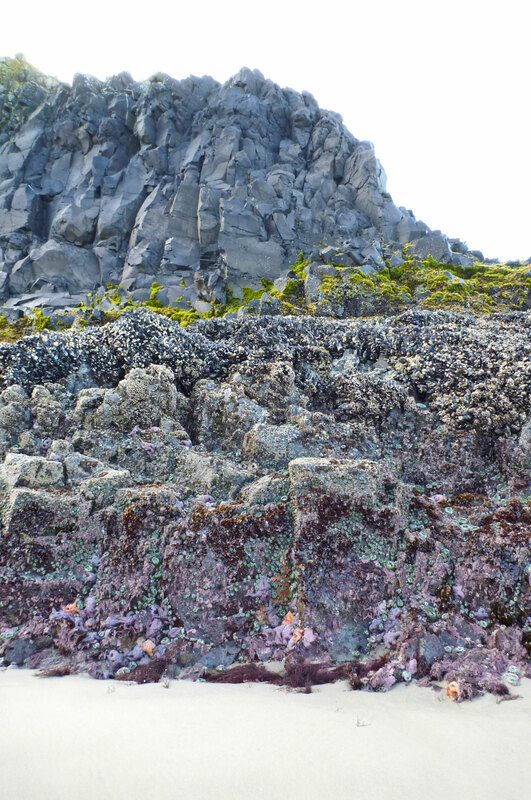 It’s worth asking if we see any changes in rocky intertidal communities. Below, I show three pairs of photos from a single site in northern Oregon. The first photo in each pair is from 2013 when Pisaster ochraceus was abundant and seemingly healthy. The second photo in each pair was taken in early July 2015, after at least a year of substantial Pisaster (and presumably other starfish) reduction due to wasting syndrome. I described the wasting syndrome chronology for Pisaster at this site in A Peek at Pisaster After Two Years of Sea Star Wasting Syndrome. 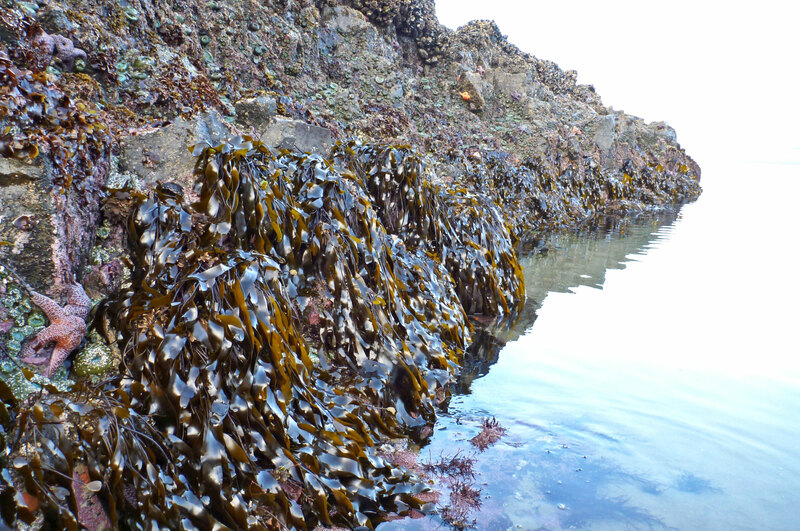 All the shots are taken in the morning during low tides, substantially below mean lower low water. See if you notice any changes. 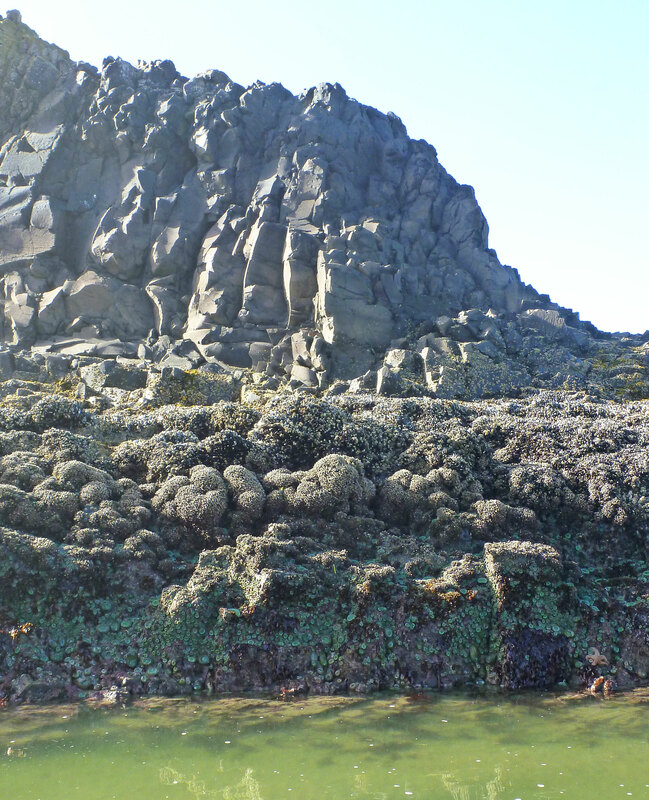 The rock shown above is a favorite of mine because it is home to pretty much all the intertidal zones. The view is to the south, so the morning sun is coming from the top left, creating a bit of glare. In the two photos above, the view is out to sea, so the morning sun is behind and over my left shoulder. 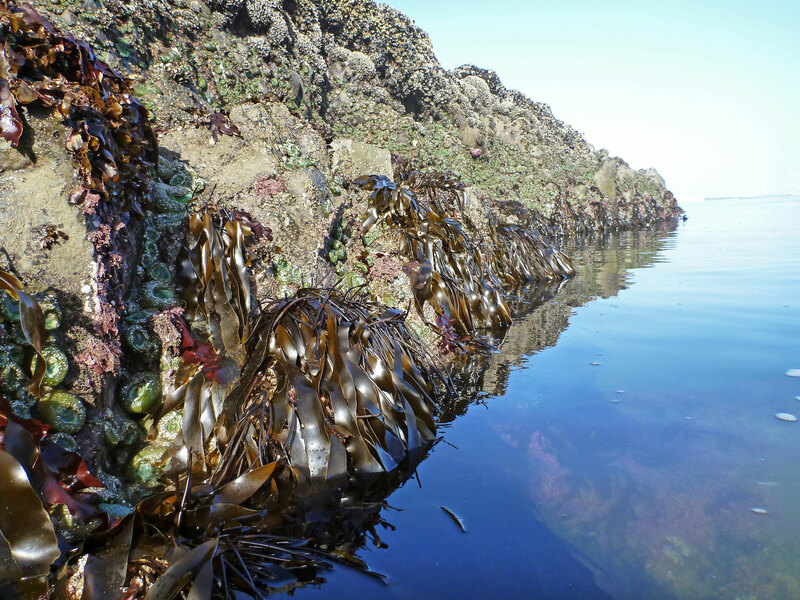 The kelp you see extending seaward is Laminaria sinclairii. It doesn’t occur much above mean lower low water. In the pair of photos above, the view is to the north, so the morning sun is over my right shoulder. On the right side of the photos you see the sunny south-facing surface of the rock. There has been some sand build-up around this rock, so perhaps the surfgrass is suffering the effects of burial. Like me, you probably notice some differences between the 2013 and 2015 images. At this scale, I’m looking at patterns rather than fine detail. In the low intertidal, for example, I get the impression of more reds in the 2013 images and more greens in the 2015 images. You can see it in all three pairs of photos, and I think part of the story is an increased prevalence of Anthopleura in the 2015 images. If you let your eyes wander higher, up above mean lower low water, it’s easy to see a billowing proliferation of goose barnacles, Pollicipes polymerus, in the 2015 images. These billows originate at the lower boundary of large mussels and are especially well illustrated in the top and bottom pairs of photos. 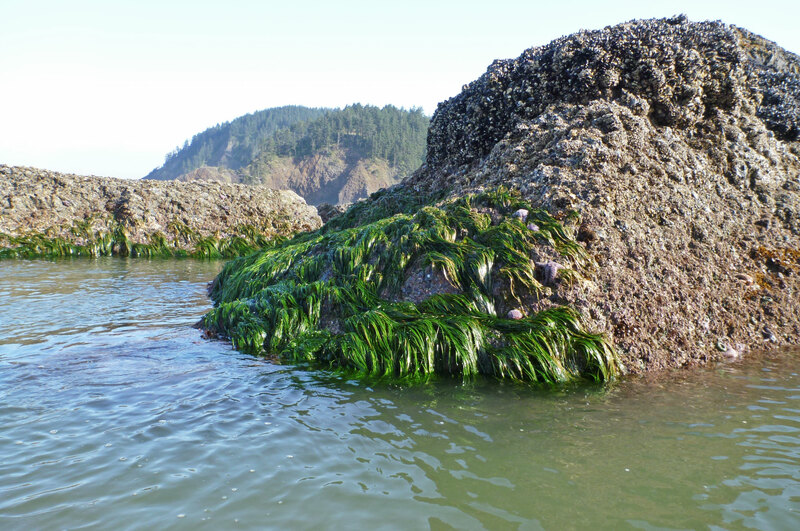 Finally, I wonder if the growth of Laminaria sinclairii, in the middle pair of photos, is less luxurious now, than in 2013; it’s not a big pattern change; just something I’m thinking about. I imagine you will find more differences, and some similarities too, if you spend some time with these photos. I confess I’m surprised by the changes, and how rapidly they occurred. In the field, even at this scale, they are dramatic, so I’m glad I got these photos. Presumably, they document, in a small somewhat haphazard and way, the results of a large-scale natural experiment that tests our ideas about Pisaster as an organizing force, or keystone species, in the rocky intertidal. Are the changes we notice direct or indirect effects of reduced populations of Pisaster and other starfish? It’s tempting to say yes, and rather difficult for me to imagine that Pisaster reductions are not responsible for the expansion of Anthopleura in the low intertidal and Pollicipes a bit higher up. After all, they now take up much of the real estate once patrolled by Pisaster. But that’s just me talking; if you want to stay on the safe side, remember that whenever there are confounding factors in play, as there are here, establishing causality is tricky. So, if you don’t subscribe to my wasting syndrome hypothesis, there’s your out. Or, is that my out? In Sea Stars and Sand Dollars I say a few words about Pisaster and intertidal zonation, with a few key references. And, if you have even a passing interest in Paine’s enduring keystone species concept, you’ll want to watch this fun animation explaining it all in rhyme. Note: The beat goes on you know, and it looks like Pisaster is already making a comeback in some places. 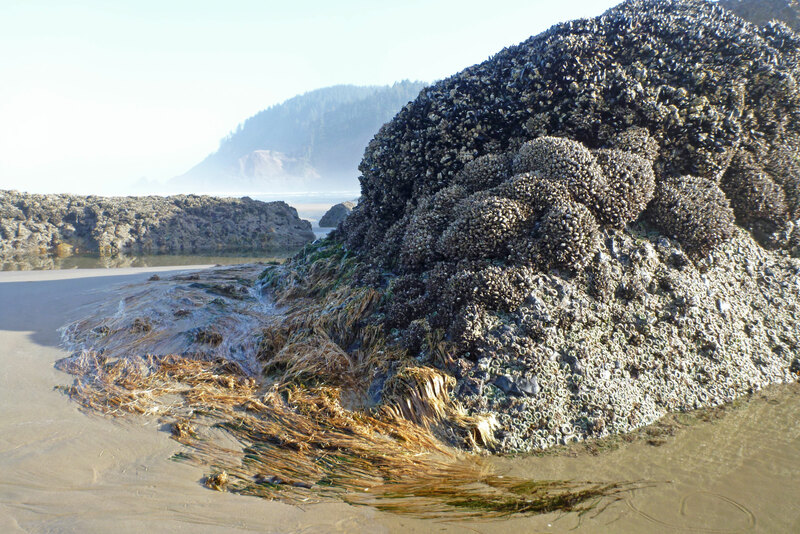 Do you think the intertidal zones will return to their previous familiar state? Note: I lightly edited the text of this post on June 9, 2018. Interesting pictures. It’s amazing how much each part of nature affects the other like this. Thanks for sharing! Glad you liked them, thanks for mentioning it. You are right Jordan, I’m always bumping into unexpected connections. See you out on the beach sometime.